You are required to eat salads everyday or every night for a month if you need the various vitamins associated with fruits such as vitamin A, C, D,E and etc. Everyone can eat salads but much more important during pregnancy. Salads is one of the best food in the world and i will say it remains a valuable gift, the western countries introduce to other countries for the sake of their health. 1. Contains Balanced Diet: The most important benefit of salads and why you need to eat salads every day for a month is the facts that it contains all the classes of food with their functions. It contains proteins, water, vitamins, minerals, carbohydrates, fiber contents and many more. 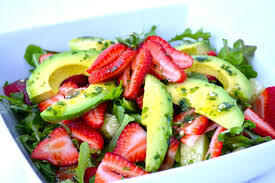 Salads is a mixture of fruits, vegetables and other foods with great health benefits. 2. Fruits & Vegetables: Another health benefit of eating salads daily during pregnancy or everyday for a month is that it contains fruits and vegetables. Fruits and vegetables contains various elements that helps the body in one way or the other. For instance, salads contains cabbages, green leafs, carrots, water melon, lettuce, pineapple, and many more. All these contains substances that helps the body for growth, skin and mental developments. 3. Weight Loss: One of the things you stand to gain when you eat salads regularly and daily for 4weeks is the facts that you cannot get fat. It contains no fat, oil or cholesterol of any kind but light food. Salads is highly recommended for weight loss and it also help renew skins cells that makes you look beautiful. 4. Vitamins and Minerals: All kinds of minerals and vitamins are contained in carrot. For example, carrot contain vitamin A for bright eyes, oranges contains vitamin c that prevents scurvy, peas contains amino acids from proteins, cabbage is a fiber plants that help in digestion, and many more. 5. Digestion: The best meal for the body that aids digestion is salads. It contains different fruits and vegetables whose main function is digestion. The issue of constipation will be a thing of the past if you eat salads. You digestion rate will be high when you eat salads and the implication on health is that, it increases your body and cell metabolism which help get rid of excess water in the body. More important health benefits of salads will be posted in our next post and i believe so far, you have learn t one or two things reading this post on the health benefit of eating salads. I really do not like eating this meal before but now, i think I'm in love with it because i love my health. Thanks for reading.